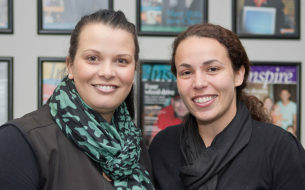 Leah Armstrong joined SVA from Yarnteen, a Newcastle based non-profit organisation with an objective to provide Aboriginal people with training and employment opportunities to provide relief from unemployment. SVA partners with Yarnteen on their RISE Hub project, an initiative designed to support the development of Indigenous social enterprises in the area. Very early on in Yarnteen’s development we recognised that along our journey to becoming successful enterprise owners and operators we would have to challenge the status quo. We would need to defy the stereo typical thinking that says the only enterprise ’black fellas’ could run were cultural or art centres – an attitude still commonly held by many business people, as demonstrated by recent discussions with corporates regarding the potential purchasing of goods and services from Indigenous businesses. These potential clients believed that Indigenous businesses were only suppliers of cultural and artistic products/services and were surprised by the offerings of law firms, accounting firms, builders, telecommunications, HR consultants, events management and caterers. But more importantly our culture at Yarnteen was to change the mindsets of our Indigenous people and community. To challenge the victimhood mentality and hopelessness created by welfare dependency. To challenge the mindset that traps us into accepting that our lives as people with special needs can only be met by outsiders. During the 18 years in which I led Yarnteen, there was always the realisation that we were treading new pathways for Indigenous development. We were attempting to balance our cultural, social and economic objectives without a roadmap. Yarnteen was also seen within our own community as being outsiders, as not an “Indigenous” organisation because we were so commercially minded. These were the challenges we faced as an organisation operating between “two worlds”. However, our vision to become ‘full free agents’ in our own development inspired us to progress and become a best practice model for Indigenous economic development. Yarnteen’s real success is not measured in financial terms but by our other achievements. The way in which we inspired Indigenous youth to dream beyond the Community Development Employment Programs (CDEP) and become entrepreneurs; how we encouraged Indigenous organisations to be economically independent and not just an agent of the government welfare trap; and how we sought to share our culture with all Australians to promote a more inclusive society. Along with this success comes the responsibility to share our story and experience with others. Yarnteen means “All or everybody” in the local Awabakal language, my hope in sharing the Yarnteen story, in the current climate of goodwill, is to raise our expectations above the maintenance and survival limitations and to obtain greater equality, decision-making control and opportunity for ALL Indigenous peoples.